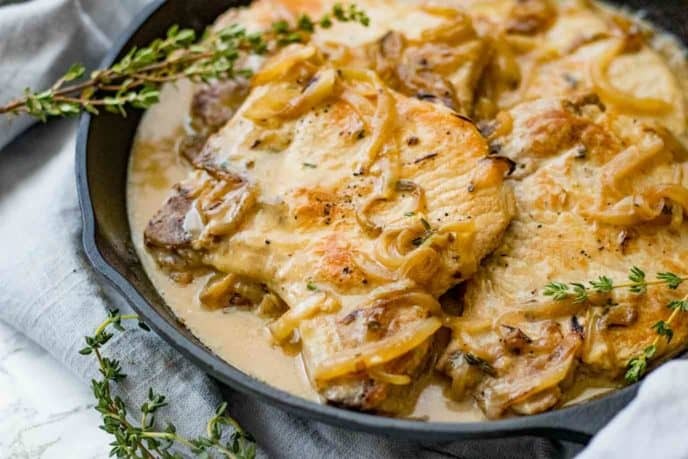 Smothered Pork Chops are tender braised pork chops served with a creamy, seasoned, onion gravy make this homemade pork chop recipe worthy of a Sunday dinner. 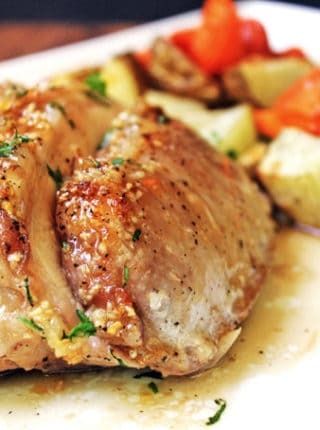 Pork Chops (like these Brown Sugar Garlic Oven Baked Pork Chops) are among my favorite foods ever. Here are some our our most popular Southern dishes that we think your family will love! Try Southern Fried Okra, Sausage Balls, and Southern Chicken Fried Steak. 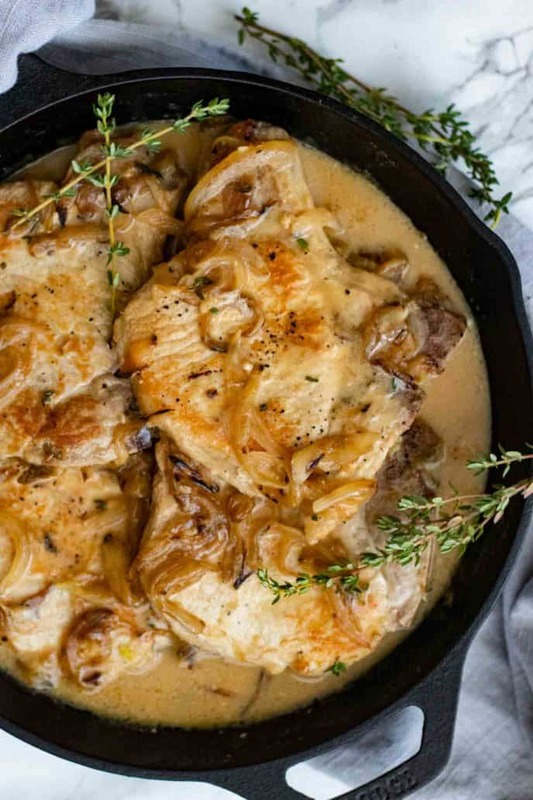 These Smothered Pork Chops will become a go-to dinner night pork classic (like our Ultimate Garlic Pork Loin Roast). Heavy cream, flour, garlic, and more combine together to form a flavorful gravy. Add the seasoned and cooked pork to obtain the perfect Southern meal. 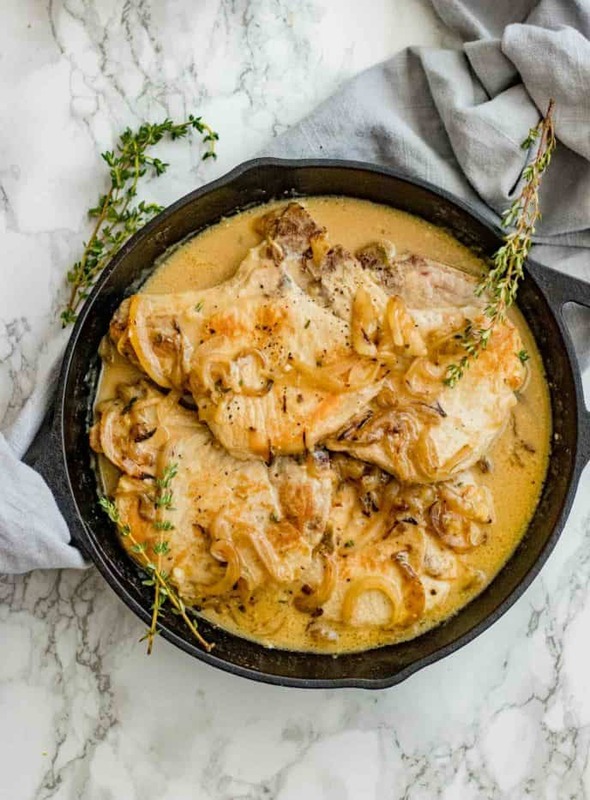 Smothered pork chops are thick, 1-inch, bone-in pork loin chops that are seasoned with salt and pepper, seared then braised in a chicken broth and cream sauce loaded with caramelized onions. Essentially the pork chops are “smothered” in their own juices and a well seasoned sauce. 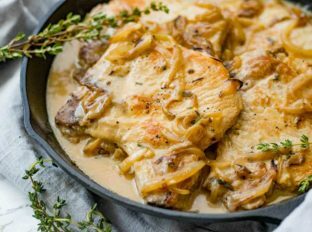 As the pork chops cook in a cast iron skillet, the onion sauce reduces and creates a luscious gravy with hints of garlic and thyme. 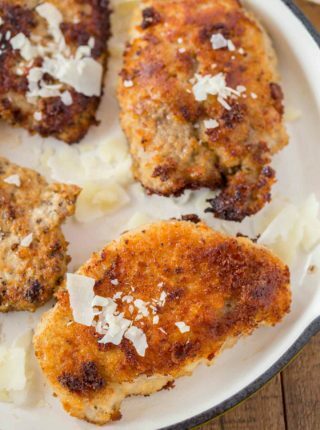 Don’t use pork cutlets in this recipe as they have a tendency to dry out quickly. Bone-in pork chops yield moist, juicy, and tender pork in each bite. Season the chops with salt and pepper then sear in a cast iron skillet on medium high heat. Set the pork aside. Add the sliced onions to the skillet and let them caramelize. Make the sauce by adding the garlic, thyme, and flour to the caramelized onions. Add the chicken broth and cream. Place the seared chops back into the skillet and simmer on medium low for 15 minutes or until the pork is tender and the sauce has reduced by half. There are many ways to cook bone-in pork chops. You can roast them, pan-fry them or even use a slow cooker on them. If you are looking for the most straightforward and least “involved” cooking option, then a slow cooker will have your solution. For the most part, you will need to dump in everything required for your pork chop. 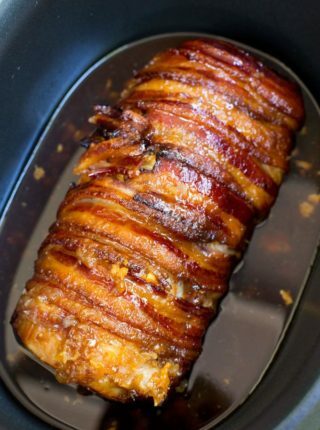 Some people will add mushroom gravy or onion soup mix right into the slow cooker so that the pork shop will be able to gain the most flavor while it cooks. If you have time, opening yourself up to other options can leave you ready for a great new dining experience. Sautéed pork chops in a skillet or a smothered and pan-fried pork chop will allow for infinite flavor combinations. Most of the time, the average cook will have everything they need to make a great meal right in the kitchen. How do I know when pork is done? The National Pork Board recommends that pork chops reach an internal temperature of 145° then given a three minute rest before serving. How Long Can Smothered Pork Chops be Stored? While pork can be frozen for up to six months when frozen fresh, a cooked chop cannot be stored for that long. Once cooked, you should keep your pork chops refrigerated for no longer than three to four days. Aim for 6 ounces of uncooked pork per person to result in the correct amount of meat. Look for pork chops that are pinkish-red in color. This will provide a better cooking and eating experience. Don’t choose chops that are pale or have liquid in the package. Make sure the pock chops you choose are marbled with small flecks of fat. However, that fat should be white with no flecks of black for the best flavor. Getting the meatiest pork chops will result in a bland Smothered Pork Chops recipe. Calculate the cost per serving to help stay in budget. Avoid getting boneless pork chops for better cost as well as a more flavor-filled sauce. If your gravy is lumpy, then pour your gravy into a blender! Make sure to blend it for a total time no longer than thirty to sixty seconds. If your gravy is too salty, then you should add a pinch of brown sugar. Don’t forget to add slowly so that you do not go too far in the other direction. If your gravy is bland, then you might not have gotten enough drippings from the meat. However, you can fix this by adding some bouillion granules. If your gravy is too thin, then simple thicken it by creating a roux in another pan and adding your thin gravy. If you cook this mixture on low heat, it should thicken nicely. Potatoes are a must– Easy Mashed Potatoes, Ultimate Slow Cooker Mashed Potatoes or Loaded Mashed Potatoes will soak up that rich gravy. Corn: Cornbread, White Southern Cornbread, Corn Succotash or Creamed Corn. Green Beans: Roasted, Sautéed or Green Beans with Bacon are a quick and easy side dish made in under 15 minutes. Season the pork with the salt and pepper and add the vegetable oil to a cast iron skillet on medium high heat, searing on both sides until browned, about 4-5 minutes on each side. Remove the pork from the pan and add in the butter and onions, cooking well until caramelized, about 15-20 minutes, stirring occasionally. Add in the garlic and thyme stirring for 1 minute until fragrant then add in the flour and stir until it is fully absorbed before adding in the chicken broth and heavy cream and whisk well. Add the pork back into the pan, reduce the heat to medium-low and simmer for 10-15 minutes until the pork chops are tender and cooked through and the sauce has thickened and reduced by half. In the ingredient list, it lists 4 tablespoons of butter. When is it used in the recipe? Thanks for catching that! You’ll want to add them in with the onions. Enjoy! Oops, looks like I needed more coffee before hitting the publish button. Haha! You’ll want to add it in with the onions. Thanks for pointing that out. You have butter in the ingredients but I don’t see where to add it in the directions. I’ve edited it to read correctly. You should add the butter in with the onions. I hope you enjoy it. Pork chops are my dad’s favorite and he comes to dinner once a week. Putting this on my list for sure. That sauce looks absolutely divine! 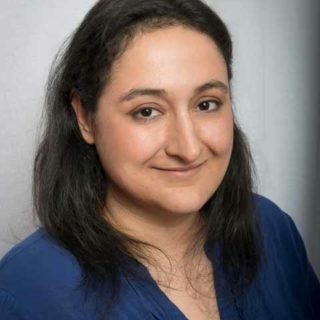 Thank you so much, Valentina! Enjoy! My husband can’t eat red meat so I am always on the lookout for pork recipes. This looks delicious, thanks so much! This looks super decadent and delicious! Thanks for sharing. The flavor in this recipe is out of this world! 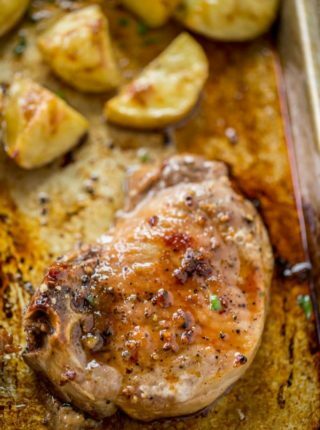 Pork chops are a favorite with my family so this recipe was a hit. I’m usually not a huge pork chop fan but my husband is so I made these and let me tell you, they were amazing! So delicious! Awesome! I’m so glad you all enjoyed it.